While we were visiting our friends recently, we all took our turn in mixing drinks for the group. We spent a lot of time on the beach and at the pool and this drink really encompasses all that as it is called "The Sunburn." Our friend Allison invented this drink and Casey named it and it is delicious! You could also make the mocktail version of this, just substitute coconut water for the liquor- just as good! All you need is some coconut vodka, margarita mix and cranberry juice. The drink is simple... equal parts of each ingredient. Pour margarita mix until you reach 2/3 of the glass. Fill the rest of the glass with cranberry juice. Garnish with 2 maraschino cherries and a straw. 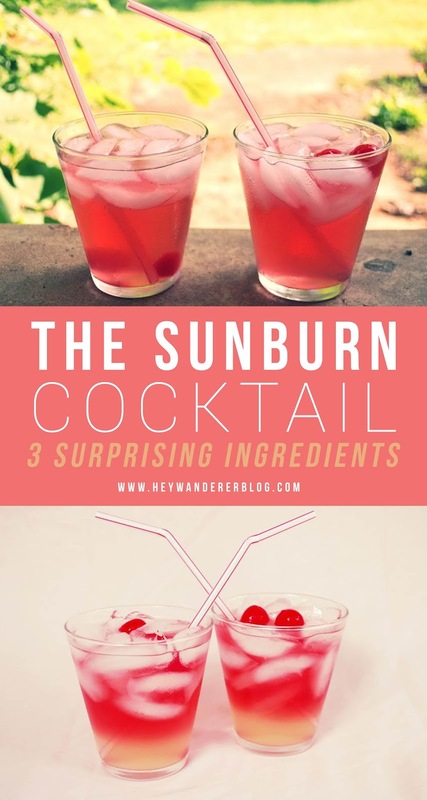 Mix it up and sip the delicious-ness of a sunburn. That looks so good! Perfect for hot Texas days! Pretty much the only good sunburn!